nailhed: The Paper City, Pt. 2: "Trying to Erase the Legacy"
The Paper City, Pt. 2: "Trying to Erase the Legacy"
My many sojourns through Kalamazoo often took me close to the large and imposing powerhouse of the Bryant Paper Co. Mill, though I only really made one trip inside. I guess I didn't have a lot of film with me that day, because I only have a few photos. It used to stand between Alcott and Reed Avenue, west of Portage Street. Sadly, most of this mill was demolished before I ever came around, though I count myself glad to have at least seen this much of what had been the oldest remaining, and by most accounts probably the most interesting to explore of Kalamazoo's iconic abandoned paper mills. There are even a couple old websites still online dedicated to the Bryant Mill (alliedpaper.org, winkworth.us/alliedpaper/), sometimes better known as Allied Paper, that show what it looked like before demolition began in 2004. David Kohrman called it "the best surviving 19th century industrial complex in the city." Though it has been used by several different corporate entities over the decades, this mill produced paper for 102 years, from 1896 to 1998. Allied Paper Corp. formed in 1921 and took over this plant's operation from the St. Regis Paper Co. in 1956 until 1988, after which a series of other owners attempted to revive it. Englishman Noah Bryant came to the Paper City in 1874 with plenty of experience in the industry already under his belt, and got a job as a machine tender at Kalamazoo Paper Co. before advancing quickly to foreman, and finally striking out on his own. According to the book Kalamazoo Lost & Found, his Bryant Paper Co. easily competed with the well-established Kalamazoo Paper Co., and the King Paper Co., and by 1902 its complex had doubled in size. By 1908, it had enlarged by another 50% according to Houghton & O'Connor. This period between 1895 and 1910 was the heyday of the Paper City, but Kalamazoo would continue to be recognized as a major center of the paper making industry for the rest of the century. 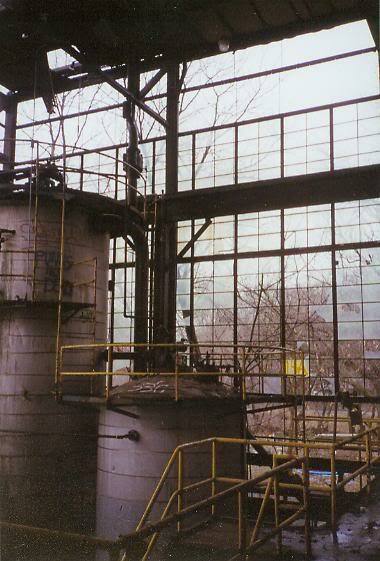 The powerplant was designed by engineer V.D. Simons of Chicago in the early 1920s, and the company was working on coming up with a new office building as well. 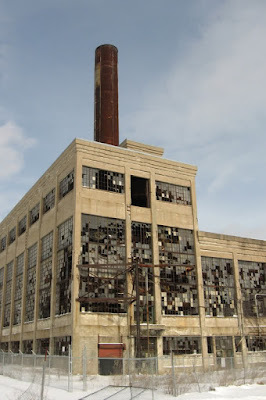 By 1930 the plant had again doubled in size from what it was in 1908, and by the mid-1950s the Chamber of Commerce reported that of the 24,200 Kalamazooans employed in manufacturing, almost half worked in the paper trades. Consolidations and new paper-making processes began to affect the Paper City by the 1960s (Allied Paper became a division of Smith-Corona-Marchant), and that was also when serious pollution concerns were beginning to be raised. In 1969 the City of Kalamazoo issued several building code violations to Allied Paper regarding their beautiful 1920s office building. Allied responded by tearing the building down and building a newer, simpler one. According to the book Corporate Wasteland, The Landscape and Memory of Deindustrialization, Kalamazoo's "Paper City" era came to an end in the 1990s when all five of its paper mills closed, putting 1,500 people out of work. 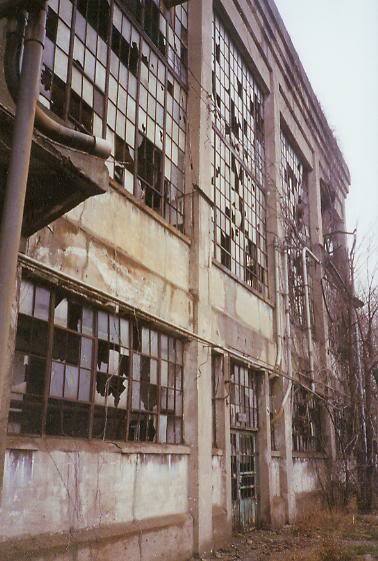 A General Motors stamping plant also closed around that time, taking 3,500 more jobs, though luckily times were generally still good back then, so the displaced workers most likely were able to find other employment. Unfortunately for Michigan, many of them may have moved to Chicago to do so, I would guess. 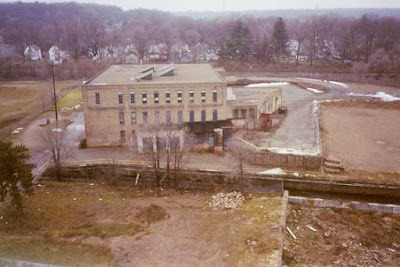 The winkworth.us website says that in 1988 an Illinois businessman fought to reopen the former Allied mill, which had just closed, with lots of upgrades planned. The risky investment's profitability depended on heavy concessions from its 304-man work force. Initially the union rejected the offer, but after a second round of negotiation it narrowly passed, and Performance Papers, Inc. started up in 1989. Unfortunately that was also when the specialty paper industry took a nosedive, and the venture died out that same year. It was only a few months however before the Norfolk Paper Co. began negotiations to reopen the mill yet again. Again, financing the idea proved tricky, but nonetheless production resumed in May of 1992 under the name Portage Paper Co., recycling corrugated containers and other clippings to make butcher's paper. 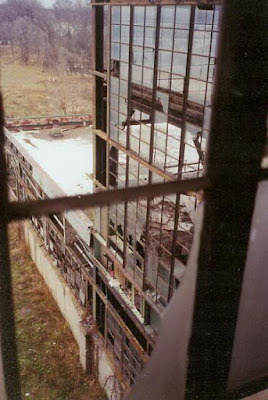 This enterprise only lasted until February 1997 however, when it was again forced to close in the face of heavy operational losses thanks to a weak paper market and lack of capital. At that time a mere 140 men staffed the mill, and when they left, production was never again to resume. The GAF Corp. tried to revive Bryant one last time by making roofing felt, but nothing came of the lease. 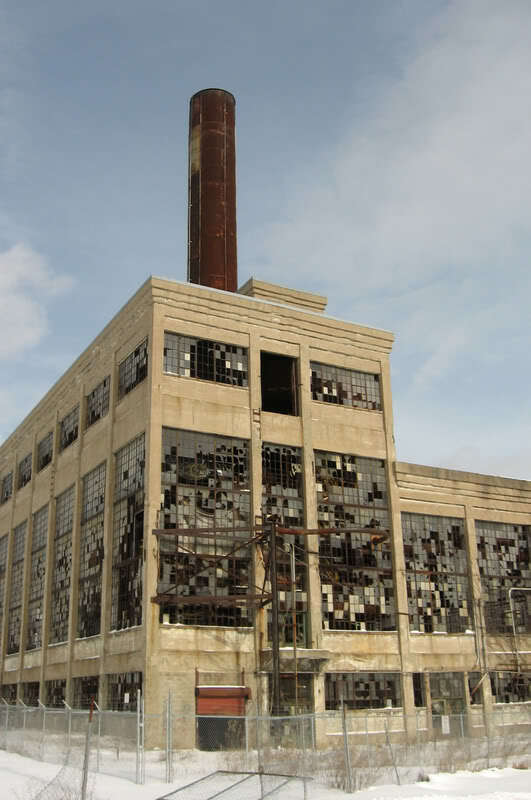 Preservationists lobbied to save Bryant Paper's beautiful antique mill buildings from demolition, but the EPA and DNR had gathered data showing just how hazardous the Bryant site was to the environment, and it became pretty much inevitable that it would have to go. 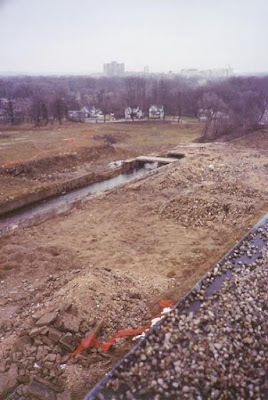 Allied had been releasing PCBs into the Kalamazoo River, which was discovered in 1986, and the state filed suit ordering an immediate end to the discharges, but by that time it was estimated that around 350,000 pounds of PCBs had already been deposited in the waterways by all the paper mills. The EPA designated an 80-mile stretch of the river as a Superfund site, and remediation efforts began as soon as the mill closed in 1998. In the early days of the Paper City the winkworth.us site said, the mills of Kalamazoo made their paper from virgin pulp. By the 1950s they began recycling waste paper stock, and mixed in with it was a lot of "No Carbon Required" copy paper. The carbon paper was sold by the National Cash Register Corporation, and between 1957 and 1971 it contained PCBs as part of the ink carrier. The PCBs themselves were manufactured by good ole Monsanto. The carbon paper itself was never made in Kalamazoo, it was solely because of the de-inking process prior to recycling this stuff into the pulp that the Kalamazoo River was polluted. 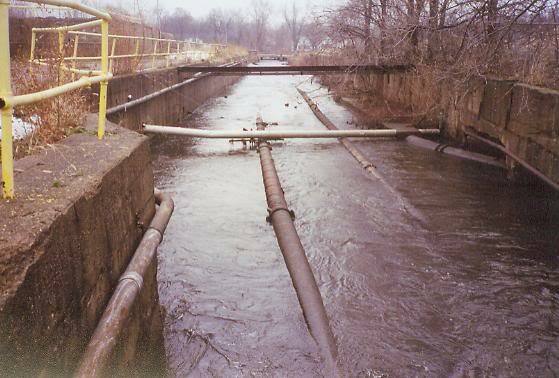 After de-inking, the particles were in the mill's wastewater which was discharged into settling ponds that were supposed to filter out the bad stuff, while the "purified" water was then subsequently discharged into the Portage Creek, which of course was a tributary to the Kalamazoo River. Allied Paper was held legally responsible for cleanup of the settling lagoons at their Monarch and Bryant mills, and along with Georgia Pacific (last owners of the aforementioned Kalamazoo Paper Co. Mill) they were also held responsible for the cleanup of PCBs in the river. The website alliedpaper.org says that in December of 2000, part of Mill "E" collapsed under the weight of snow that had accumulated on its roof. In October of 2001, the part of Mill "C" containing laboratories and offices caught fire in what was suspected to be arson by vandals, and another suspicious fire destroyed a section of Mill "D" in July 2003. 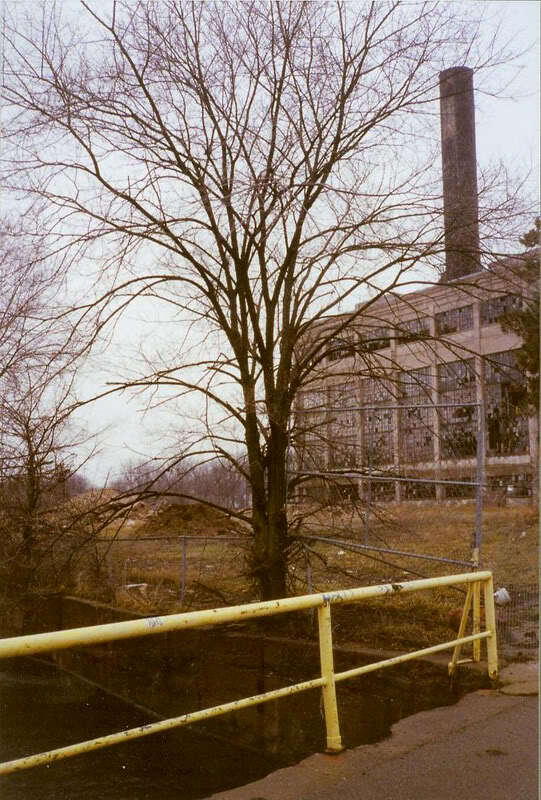 In 2004, the City of Kalamazoo hired Homrich Inc. to begin demolition of the Bryant Mill, but as David Kohrman pointed out, the contractors stopped right before they got to this powerplant. "Evidently the power plant had more asbestos than they anticipated." I for one don't buy that a demolition contractor "didn't know" how much abatement was going to be needed before bidding on a job, and suspect it was a ploy of some sort. Anyway, the result was that as David says, "instead of the 'safe' land ripe for redevelopment that was promised, the neighborhood is left with the most dangerous building still up and a vast expanse of toxic rubble." 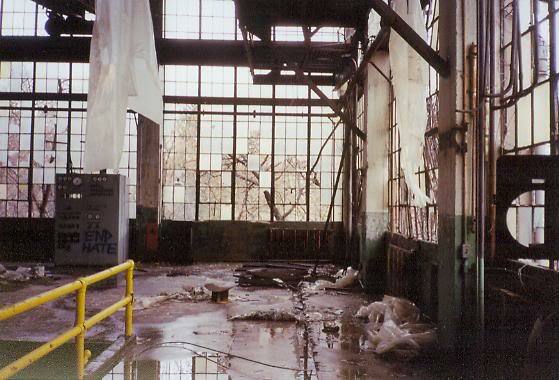 The book Corporate Wasteland also notes that in August 2004 the demolition crews discovered a drug lab in one of the mill buildings, reflecting Kalamazoo's newfound prominence in another budding industry, that of crystal meth production. On my last trip to the old Bryant powerplant in January 2006, I found that a secure fence had been erected around the beast. Today only the Illinois Envelope Building still stands; the powerhouse has finally been removed and the lands remediated. The Paper City, Pt. 4: "A Fallen Satellite"
The Paper City, Pt. 3: "Bloodsweat & Gears"
The Paper City, Pt 1: "Where it All Began"